THE work of an Italian master craftsman ii celebrated in a special exhibition and a new book published by the Farnham based Squires Group. Stunning examples of the work of Professor Agostino Dessì can be seen in the book and at the Squires Kitchen Sugarcraft shop, Waverley Lane, and Ottakers bookshop in the Lion and Lamb yard. The sales and marketing manager of the Squires Group, Andrew Nice, explained the masks are works of the art in their own right. 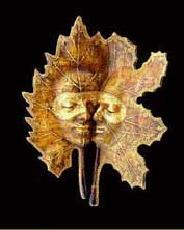 "We have 50 masks in our shop, they have each been hand-made. Agostino's work is internationally renowned, he has been a mask maker for more than 30 years and he has produced a very wide variety of masks", said Andrews. during the busy carnival season. The team then travelled to the professor's current home town, Florence, where a book launch was attended by special guests including the president and vice-president of the prestigious Academia di Belle Arti di Firenze. Commissions for the masks have been accepted by the professor from celebrities and they are made by using a cast of the clients' face. The masks on display at Squire's Kitchen Sugarcraft start from £70. It is a colourful addition to any coffee table and, as well as providing a history of the craft and the various masks, it gives instructions for anyone who would like to try to make a mask for themselves. The tradition of mask making is believed to date back hundreds of years, to days when the Commedia dell'Arte players would wear various masks to portray the characters in early theatrical productions. A team from the Dutton Publishing team, which is part of the Squires Group, attended an official launch of the book in Venice last month. 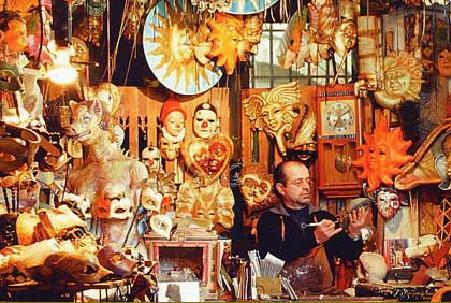 The colourful workshop, in Florence, and stunning masks of Professor Agostino Dessì. 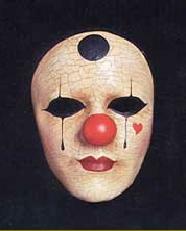 The "Alice Clown" mask and "Love Leaves" mask by Professor Agostino Dessì are pictured.